What could be more perfect than a beautiful piece of jewelry that can enhance your healing, inspire, and energize you. 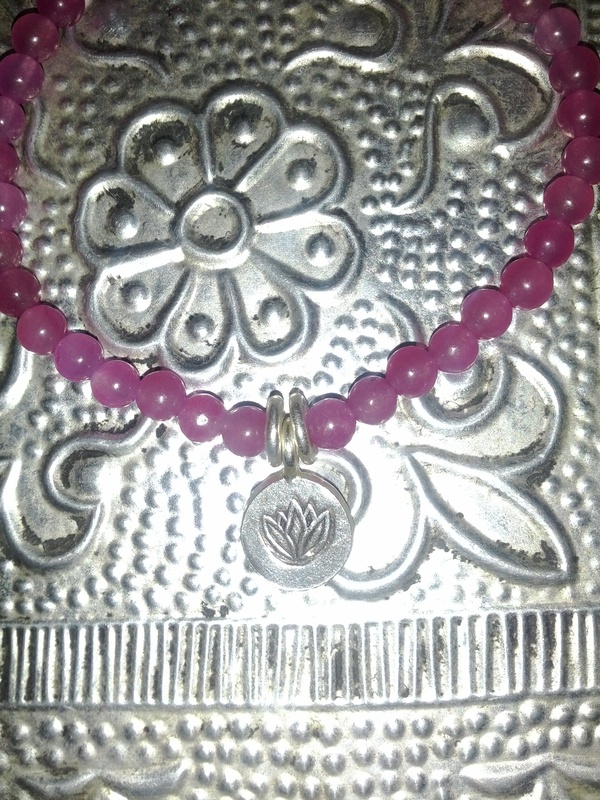 These bracelets are made with genuine gemstones, which offer unique healing properties, beautiful silver charms and accents made by a hill tribe in Northern Thailand engraved with lotuses or the Om symbol, and then charged with Reiki energy. These bracelets are made with various gemstones including tiger’s eye, turquoise, amethyst, rose quartz, jasper, green aventurine, and jade. Each gemstone has unique healing properties that can assist you in dealing with your unique issues or needs. You can select the gemstone based on its known healing properties, your personal preference or guidance, or ideally let me choose one for you based on my intuitive guidance (as I do in treatments). Turquoise – communication – this stone can assist in improving communication and leadership. On a physical level, it can assist with arthritis, bone disorders, lung issues, and inner ear problems. It can absorb negative energies and balance mood swings. It is associated with the throat chakra. Red Tiger’s Eye – creativity – this stone can assist in boosting creativity and success. On a physical level, it can assist with reproductive issues and is recommended after surgical procedures. It is associated with the base chakra. Amethyst – intuition – this stone is best known for encouraging focus during meditation and developing your intuition or clarivoyance. Amethyst is also an excellent stone for healing and for dealing with addictions. Emotionally it can soothe anger and impatience and reduce occurrance of nightmares. This stone is associate with the third eye chakra. Rose Quartz – love – this stone encourages feelings of unconditional love and peace. It can aid in healing physical and emotional wounds and releasing repressed emotions. It also absorbs negativity and is an excellent grounding stone. It is associated with the heart chakra. Green Aventurine – luck – this stone encourages luck with new ideas, ventures, or taking a chance. On a physical level, it can help eyes, the heart, and female reproductive organs. It can improve psychic abilities. It is associated with the heart chakra. Jasper – strength – this stone assists with tackling problems and confronting opposition or obstacles. Physically, it can aid in dealing with menstrual problems and increasing energy or stamina. It is an excellent stone to give someone who has been in the hospital for a long period or who suffers with chronic depression. Jasper is protective. 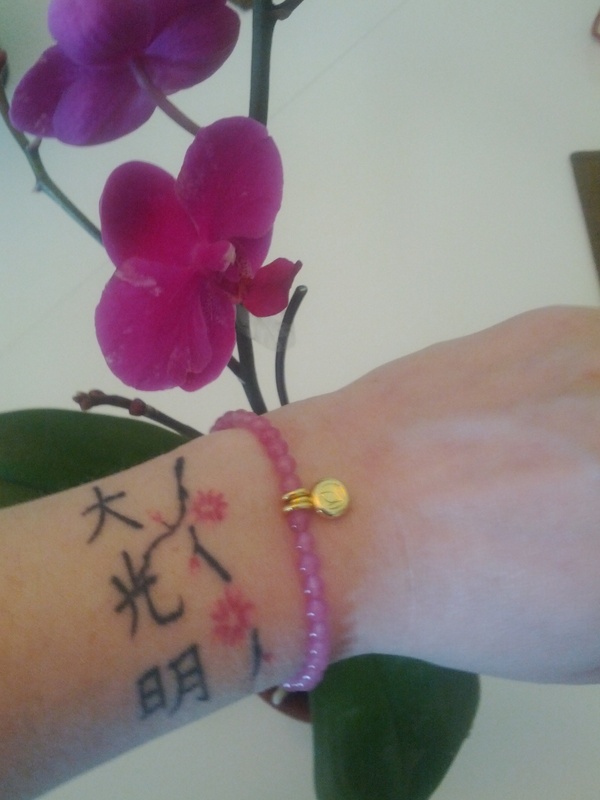 Jade (dyed rose) – prosperity – this stone is best known for encouraging prosperity and good fortune. Jade is also an excellent healing stone and can help resolve emotional or spiritual problems. It calms the mind and emotions and aids self-love and -esteem. It can also encourage passion in relationships. This stone is associated with the heart chakra. The beautiful charms on these bracelets are made by the Karen Hill tribes in Chiang Mai, located in Northern Thailand. 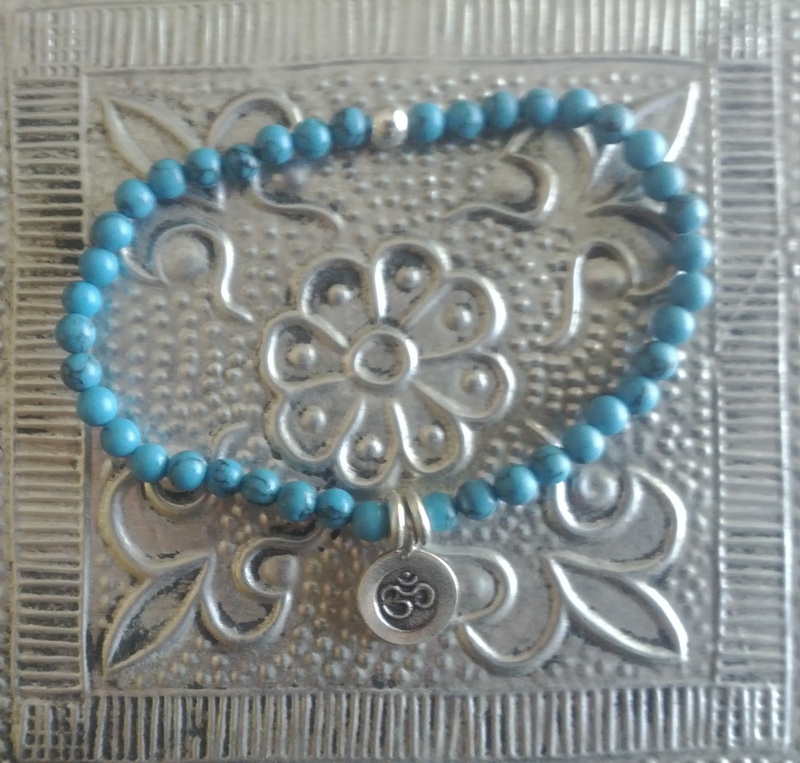 The choices for charms include silver “Om” symbols or lotus flowers . The charms are accented by silver donut beads made by the same artisans. The silver is made of 99.5%. The silver charm bracelets retail for $40. The bracelets are elasticized and can be stacked. Customized bracelets can be made upon request.